This assignment was to retell a fairy tale from the point of view of one of the minor characters. Mother used to weep and worry about me, alone in her room late at night. I knew it was me she was unhappy about. Once I had a nightmare and went to her room, crying. I climbed into bed with her and closed my eyes as she wrapped her arms around me. I was breathing heavily and my cheeks were wet. Mother hushed me, murmuring “What’s to become of you, my ugly one?” I knew she worried more about me than my sister Druzilla. Druzilla is plain, I am ugly. We were very poor after our father left. To survive we ate ramen noodles and boxed potatoes. By the time I was seven, I was the size of a 12 year old – my clothes strained against my thick thighs and ample belly. I stopped going outside to play, preferring my dolls to the withering stares of the other children. Mother said not to worry, it was baby fat, and besides, there were too many dangers in the neighborhood. When Mother met step-father, she told him our father was dead, which was probably true. I am sure she used every feminine charm in the book except pregnancy to get a wedding ring on her finger as quickly as possible. It worked. She came home one day, humming and smiling. “Our lives will be much better, girls,” she said. Within a month, we were living in a castle. It didn’t take long for Mother to get used to wealth. Mother became a shopaholic, ordering clothes and shoes and jewelry by the pound. It was as if we were all more valuable to her now that our clothes and shoes were better made. That first year, I wore a beautiful yellow dress with smocking for Easter Sunday. Druzilla wore the identical dress, only in light green. Patent leather shoes, crocheted bags, and dainty gold crosses made our outfits complete. It was Easter, and Mother wanted to make a statement at church. Cinderella was five years old that year. Back then, we call her by her real name, Ella. Mother had gotten Ella a light blue dress too, but without the smocking in front. She wore last year’s shoes and carried last year’s bag. Mother said she was already all set so she didn’t need new accessories, whereas we needed new things because we never had them before. Ella wore the gold cross her mother had given her before she died. The cross was a little bigger than mine and Dru’s, and Mother made her tuck it inside her dress. “Doesn’t pay to be ostentatious,” she murmured, her brow furrowed. We all lined up in the front hall for photos. I saw Mother’s mouth form into a tight smile as she raised the camera. Ella’s beautiful blond hair was shimmering, and her face was radiant with a sweet smile. She was not pretty; she was fantastically beautiful. Our brown hair hung limply, despite Mother’s efforts with rollers and curling irons. Looking back, that Easter Sunday was the first time Mother realized how much Ella outshone us all. That was the beginning of her hatred for Ella. She realized Dru and I could never find good matches because we would always be in Ella’s shadow. I began to resent Ella one Spring afternoon when she was 10 and I was 12. We were playing in step-father’s apple orchard. I loved to roam around the orchard, gathering the fallen apples in a basket to bring to the horses. That day Ella was with me She ran ahead in the orchard and started to climb one of the trees. “Not me,” she said. “Maybe you will. I mean, you know, “ then she turned her back to me and scrambled up the tree, higher and higher. I watched her blonde braids disappear into the leaves as she rose to the top of the apple tree. She was slim, strong and nimble. Over time, my resentment of Ella hardened into the purest form of hatred. The mirror told no lies, the cruel reflection of all my adolescent woes. I went through all the typical rights of adolescence – acne, braces, corrective shoes because my feet pointed out. Ella’s skin remained flawless, her teeth were white and straight, and she moved with the grace and poise of a dancer. I knew for certain that Ella was far more glamorous than I would ever be. Our writing assignment was to create a piece about the oldest piece of clothing we own and why. I wrote this, then rushed home to my thrift store donation bag and retrieved it. Once I spoke in the apron’s voice, I saw its true value. I hang down to Laura’s knees, even with my strings tied twice around her waist. When Tessie used me, she folded me up and double crossed the strings so I stayed put. I’m made of thick cotton and I’ve held up pretty well for more than 80 years. Tessie wore me on Saturdays when she made her sauce and turned mounds of fresh dough into long strands of pasta for Sunday dinner after church. She always laid the pasta out to dry on another thick cotton cloth stretched across her bed. I’m cut from the same material. Laura doesn’t wear me much. She hasn’t figured out that a good way to spend her Saturday afternoons is with me tied tightly around her waist as she stirs her sauce and cranks the machine that turns dough into Sunday meal. Silly girl. This writing assignment invited us to tell a story about a couple in a photograph provided to us by our instructor. It depicted an elderly couple dressed in dark clothes. Both were very thin and looking straight into the camera with serious expressions. The man looked a little unkempt, with a long straggly beard and wild hair. The woman was dressed all in black, with a cameo at her neck. If you were looking for a war hero this is the last place you would look. War heroes are those old men who march down Main Street on Memorial Day, heads held high, saluting smartly. War heroes are bathed in glory. We don’t know what to do about those other soldiers, the ones who come home too haunted and broken to cross the street. Maybe some stories are better left untold. It’s easier to pity a broken man than to honor him, because if you did you would have to acknowledge all the contradictions of war. Most of us don’t want to do that. For those that are willing, this is the story of our Earl Ward. Everyone knows Earl Ward. He lives on the outskirts of Chama, population 1,200, elevation 8,000 feet, County Rio Arriba. The Ward property consists of a rundown farmhouse and some cottonwoods that hug the Rio Chama River shy of the Colorado state line. Earl was born in that house. With the exception of his years in the military, he has lived there his entire life. Everyone leaves Earl alone. The Ward family never participated much in the civic life of Chama. Earl’s father, Foster Ward, came here from Oklahoma in 1910, looking for work on the Cumbres and Toltec Railroad. He set up a moonshine business, purchased four acres and built the old homestead. Foster was a man of few words and strong hooch. He ran a fair business, but he didn’t want friends. The story goes that Foster’s first wife Marybeth died while giving birth to Earl, and that planted the seed of the mental defect in Ward. After Foster buried Marybeth, he brought the baby Earl over to the saloon. He paid one of the painted ladies to watch the little baby while he rode over to the Jicarilla settlement ten miles down Rio Chama. By day’s end he returned with Millie, his second wife, and she became Earl’s mother. Far as anyone could tell, Millie and Foster and Earl got along just fine. Millie used to visit with her people on pow wow days, and she would bring little Earl with her. Some people think something happened to Earl at one of those pow wows. They think a broken spirit settled in him. When Foster died in 1939, Millie went back to her people, and Earl went with her. He met Annabelle on the reservation. She was a tall girl who spoke little and smiled less. It’s hard to imagine the courtship of Earl and Annabelle, but those two have been married for 50 years. Not long after he married Annabelle, Earl joined the 200th Coast Artillery and shipped out to Manila. When the Japanese bombed Clark Field right after Pearl Harbor, December 9, 1941 Japan time, the 200th were the first to defend. The Americans fell to the Japanese four months later, and Earl’s nightmare began. He was one of the soldiers in the Bataan Death March. Maybe you have heard of the atrocities that went on there. But Earl survived Bataan and became a prisoner of war. He worked for three years in a Japanese coal mine that stretched out under the ocean. For a man used to big sky country of northern New Mexico, the mine must have felt like being buried alive, like he had been driven to the underworld. When Earl came home in 1945 he was a haunted man. He and Annabelle resumed married life in the Chama homestead, but they never had children. Earl rarely left the house. He didn’t want any part in Memorial Day services or VFW events. After a couple of years he stopped shaving. He bathed less and less. Then he stopped talking. Eventually people just left him alone. We saw Annabelle in town from time to time but she kept to herself. When she went over to the pow wows, she left Earl behind. If Annabelle knows what nightmares Earl suffers from, she keeps it to herself. Once, she told my wife what was going on with Earl – how he would startle at sudden sounds, his cries of anguish. Demons from the other world were attacking him, she said. They were trying to take his spirit back down to the earth before it was time. About five years ago a gentleman from the State Veterans of Foreign Wars came to Chama and asked around for one Earl Ward. He told us the VFW was planning a special ceremony down in White Sands to honor New Mexican veterans from World War II. They wanted Earl to attend. Here in Chama we tend to protect our own. We told that man we hadn’t seen Earl since 1941. We told him we didn’t know where Earl was. We make wars to make heroes. There are new wars now, new vets coming home after long deployments. Some of them will march down Main Street next Memorial Day. But others will be haunted by the demons of war. You may never see them, but they are there. I live near Bedford, New York, where Mary Richardson Kennedy and her children lived and where she died. I do not know the family, but Mary’s suicide has been in my thoughts all week. Most of the news articles refer to her lifelong struggle with the demons of depression. The articles also laud her considerable accomplishments in supporting food allergy research and environmental protection. I think if she were reading her obituaries she would be most proud of the acknowledgments of her love and protection of her children. I imagine that it was that love that sustained her throughout her life. There must have been many mornings, many moments, when she found the strength to face the day because she knew her children needed her. It’s both baffling and entirely understandable why Mary’s love for her children could not sustain her in the end. It is baffling because we grow up believing that a mother’s love is strong enough to withstand any challenge, including the demons of depression. And it is understandable because that very love can become a force that pulls you down. Severe depression can make a mother feel a profound sense of failure. It can lead her to feel as though she is not strong enough and not happy enough to contribute meaningfully to her children’s lives. A mother’s depression creates unbearable tension. You are aware of you love for your children but you are so weakened and in so much pain that there becomes only one logical solution to ending the pain. By removing yourself you restore balance to your family. You give your children the opportunity to live free of your cloud. I don’t know why Mary chose to die by hanging herself. Perhaps she only had the strength to walk across the yard at that point. Maybe she was determined that her children would not find her in their home. It feels like a terrible invasion of her privacy to even consider what her final thoughts were. The media was in full Kennedy frenzy this week. A few days ago I passed the entrance to the Kennedy home and saw the cluster of paparazzi at the end of the driveway. I figured once they got their photos of family members through the woods they would leave, moving on to the next big story. I was wrong. Yesterday I was in the pretty little library in Bedford Village. I wait in the reading room while my son has his music lesson. The reading room was filled with men and their laptops. A few had large cameras on the table. There was one sitting chair available by the table and I settled in to the read the Bedford Record Review. I thought it was odd that so many men were in the reading room, but I wasn’t thinking about current events. After a few minutes, when I heard them discussing the Kennedy family did I realize they were paparazzi. At first, it shocked me that the photographers had chosen the village library for their headquarters. Then I realized why. The library was air conditioned, it provided a free power source, and there was nothing the librarians can do to remove them as long as they kept their voices down. As I got up to leave, I asked them whether any of them were writers. “No,” one replied, “they don’t trust us to write.” I told them I could see that. Then I told them I hoped they would leave the Kennedy children alone. They are young children, and it was the decent thing to do. They responded that the story was over for them and they would be leaving shortly. My point was missed entirely. Some people stare down the abyss of depression and fight their way back from it. They keep their demons at bay, as Mary did for so long. The tragedy of Mary’s suicide is a private affair, no matter how may photographs get published. I hope her children find comfort in their memories of their mother’s love, and the love of their family. Long before my present life, I spent a year in the desert. 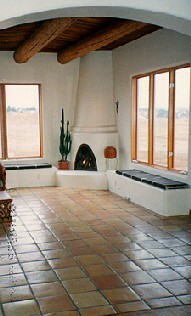 I rented a small adobe house with a traditional kiva fireplace in the corner and large windows throughout. It was the only home I ever lived in by myself. I was very young, just 21. My college years over, I had been living a nomadic existence, moving from dorm room to dorm room, then through a series of off campus house rentals shared with other students. The move to the desert was my first opportunity to be on my own. I feared and craved it. I was determined to stay in Santa Fe and never return back East. On trips home, summers and holidays and spring vacations, I couldn’t shake the sense of being underwater. The trees along the parkway were too green, greedily blocking the sky. In just a short time I had grown accustomed to a different horizon, to the smells of chamisa and pinon, to mountains and a sky that went on forever. The light in Santa Fe was a crystal halo I couldn’t leave behind. So I decided to stay. I cobbled together a few jobs, and scanned the classifieds. I didn’t have much money and the desert rental was cheaper than living in town. The landlord was friendly enough. He had built the house himself and was proud of its thick walls and colorful tiles on the kitchen counters and bathroom sink. I settled in quickly, driving to town in my old VW bus to a patchwork of jobs and errands and visits with college friends who, like me, had also not wanted to leave. And then the long drive back to my little house. I still remember moving around that house in an expectation of discovery that oscillated in and out of loneliness. It is now more than 25 years later, and the sense of being the past, present and future at once is strong. I reflect on choices I made. At the end of my year in the desert, I left Santa Fe and returned home to New York. I never left, spent years studying and working in Manhattan, living in the suburbs. And while I consider myself a New Yorker, I still feel the 21 year old person who learned to listen to the wind and appreciate a broader horizon. And while I’m no longer lonely, I still have an expectation of discovery, of trying to find the right chords to my symphony. the crickets, cicadas and katydids are singing these last nights of summer away. there is a gallant breeze through the leaves. the sky is a soft blue, and the tomatoes are ripening on their vines. one good thing about today. it is the slow winding down of summer, a pause before the leaves float down, before the earth draws into herself in readiness for winter’s rest. one good thing about today is the realization that some worlds come to an end so that others may germinate. is this a moment of happiness or a pause along the arc of joy?